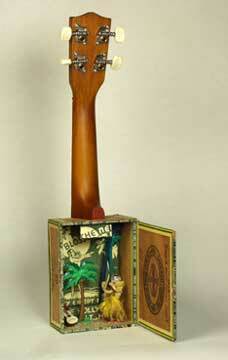 Ukulele Series Book #15 The Cabinet of Curiosities - Cigar Box Ukulele. 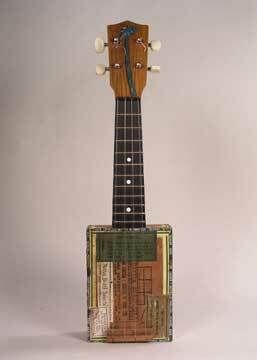 2002 A small sized cigar box was attached to a soprano ukulele neck. 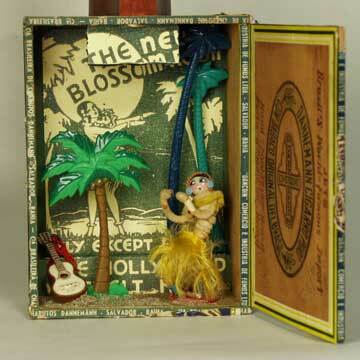 Inside the cigar box is a diorama which tells a story about the historical allure of Hawaii as an archetype of tropical paradise. Artists often think of these structures as books because of the way they tell a story, and the story can be different for each viewer.